Pragati is Vibha’s endeavour to organize Bi-Annual conference that brings all its partner projects on one platform and with a mission to “Connect, Share and leverage”. This year, in addition to the usual practise of working closely with their project’s, Vibha included Pragati CSR 2013 in its agenda. It was held at United Theological College, Bangalore on October 4th. As part of his effort to create awareness of the CSR law within Companies Act, Dr Chatterjee urged all the corporate bodies to work towards building CSR Committee which will hold high accountability for all the actions the company decides to take towards its CSR Initiative. His keynote focused upon the importance for companies to understand the CSR law, and how all the actions taken in this direction need to declared, monitored and shared with the public and media in general. Few excerpts from his keynote include – CSR’s must be implemented in the right direction, must be measurable, is meant to address Indian social and economic needs, and should be compliant with legislation. 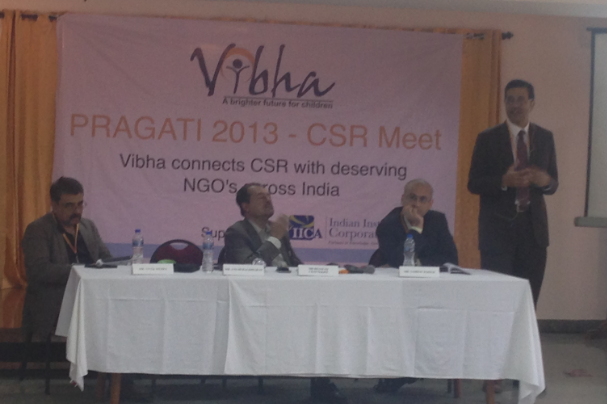 The other highlights from Vibha’s CSR Pragati sessions include – a) CII Karnataka’s efforts to create awareness and sustain CSR contributions via national summits organized every year since 2007. CII has been involved in providing the corporate view / consultation to the IICA. b) Mr Vaibhav Parikh’s legal perspective along with this emphasis on the need to create a social business environment in India. He introduced the concept of interdependence, where Corporate system is tied together with social, economic and legal / ethical mix. He also touched upon the FCRA Act, and difference between the Profit and Philanthropy models. c) Mr Vivek Mehra used a very personal experience to demonstrate the ‘will’ to do good towards the society, and do right when it comes to managing employees within the company. He highlighted Sarah’s (founder of SAGE Publications) excellent contribution and living style where she donates 82% of her income every month towards charitable causes. 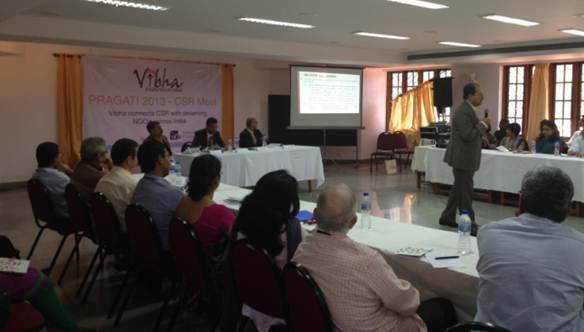 Vibha then had its management talk about how Vibha is working with partner projects to make a difference, what goes into selecting and monitoring the projects, what services it can offer to the corporate bodies and welcomed questions pertaining to the day’s session. Some of the highlights from Vibha’s note were that Vibha’s relationship with partners which is based on values of mutual respect with a participatory, consultative approach. Its focus is towards enabling projects, help them scale and build a self-sustainable model. Vibha’s footprint in India was also shared.